Version 1.1 of the super-fast PCAP parsing tool CapLoader is being released today. 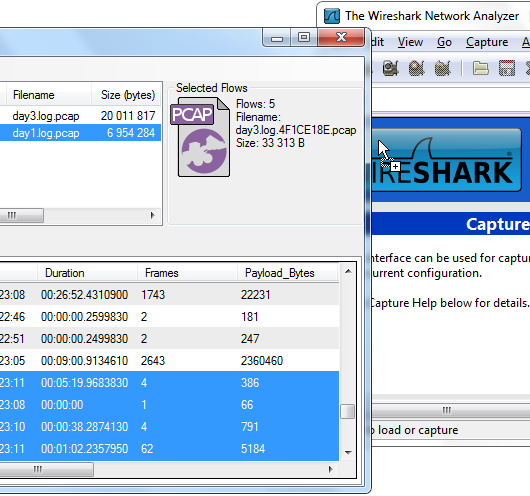 CapLoader is the ideal tool for digging through large volumes of PCAP files. Datasets in the GB and even TB order can be loaded into CapLoader to produce a clear view of all TCP and UDP flows. CapLoader also provides instantaneous access to the raw packets of each flow, which makes it a perfect preloader tool in order to select and export interesting data to other tools like NetworkMiner or Wireshark. Another thing that is completely new with version 1.1 of CapLoader is that we now provide a free trial version for download. The CapLoader trial is free to use for anyone and we don't even require trial users to register their email addresses when downloading the software. There are, of course, a few limitations in the trial version; such as no protocol identification, OS fingerprinting or GeoIP localization. There is also a limit as to how many gigabyte of data that can be loaded with the CapLoader trial at a time. This size limit is 500 GB, which should by far exceed what can be loaded with competing commercial software like Cascade Pilot and NetWitness Investigator. The professional edition of CapLoader doesn't have any max PCAP limit whatsoever, which allows for terabytes of capture files to be loaded. The trial version of CapLoader can be downloaded from the CapLoader product page. The professional edition of CapLoader can be bought at our Purchase CapLoader page. Customers who have previously bought CapLoader 1.0 can upgrade to version 1.1 by downloading an update from our customer portal.